Wichita (/?w?t??t? ?/ WITCH-i-taw) is the largest city in the U.S. state of Kansas. Located in south-central Kansas on the Arkansas River, Wichita is the county seat of Sedgwick County and the principal city of the Wichita metropolitan area whose estimated population in 2015 was 644,610. As of 2017, the city of Wichita had an estimated population of 391,586. The city began as a trading post on the Chisholm Trail in the 1860s and was incorporated in 1870. It subsequently became a destination for cattle drives north from Texas to railroads, earning it the nickname "Cowtown". In the 1920s and 1930s, businessmen and aeronautical engineers established aircraft manufacturing companies in Wichita including Beechcraft, Cessna, and Stearman Aircraft. The city transformed into a hub of U.S. aircraft production and became known as "The Air Capital of the World". Textron Aviation, Learjet, Airbus and Spirit AeroSystems continue to operate design and manufacturing facilities in Wichita, and the city remains a major center of the U.S. aircraft industry. Wichita is also home to McConnell Air Force Base. As an industrial hub and the largest city in the state, Wichita is an area center of culture, media, and trade. It hosts several large museums, theaters, parks, and entertainment venues, notably Intrust Bank Arena. Wichita State University is the third largest in the state. Wichita is also home to the Century II Performing Arts & Convention Center and Kansas's largest airport, Wichita Dwight D. Eisenhower National Airport. Archaeological evidence indicates human habitation near the confluence of the Arkansas and Little Arkansas Rivers, the site of present-day Wichita, as early as 3000 B.C. In 1541, a Spanish expedition led by explorer Francisco Vázquez de Coronado found the area populated by the Quivira, or Wichita, people. Conflict with the Osage in the 1750s drove the Wichita further south. Prior to American settlement of the region, the site was located in the territory of the Kiowa. Claimed first by France as part of Louisiana and later acquired by the United States with the Louisiana Purchase in 1803, it became part of Kansas Territory in 1854 and then the state of Kansas in 1861. The Wichita returned in 1864 due to the American Civil War and established a settlement on the banks of the Little Arkansas. During this period, trader Jesse Chisholm established a trading post at the site, one of several along a trail extending south to Texas which became known as the Chisholm Trail. After the war, the Wichita permanently relocated south to Indian Territory (present-day Oklahoma). In 1868, trader James R. Mead established another trading post at the site, and surveyor Darius Munger built a house for use as a hotel, community center, and post office. Business opportunities attracted area hunters and traders, and a new settlement began to form. That summer, Mead and others organized the Wichita Town Company, naming the settlement after the Wichita tribe. In 1870, Munger and German immigrant William "Dutch Bill" Greiffenstein filed plats laying out the city's first streets. Wichita formally incorporated as a city on July 21, 1870. Wichita's position on the Chisholm Trail made it a destination for cattle drives traveling north from Texas to access railroads which led to markets in eastern U.S. cities. The Atchison, Topeka and Santa Fe Railway reached the city in 1872. As a result, Wichita became a railhead for the cattle drives, earning it the nickname "Cowtown". 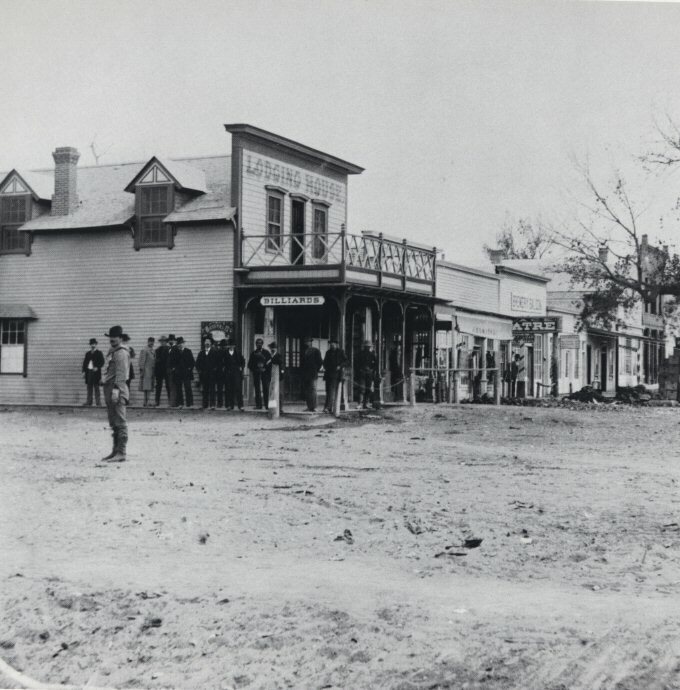 Across the Arkansas River, the town of Delano became a popular entertainment destination for cattlemen thanks to its saloons, brothels, and lack of law enforcement. The area had a reputation for violence until local lawmen, Wyatt Earp among them, began to assertively police the cowboys. By the end of the decade, the cattle trade had moved west to Dodge City. Wichita annexed Delano in 1880. Rapid immigration resulted in a speculative land boom in the late 1880s, stimulating further expansion of the city. Fairmount College, which eventually grew into Wichita State University, opened in 1886; Garfield University, which eventually became Friends University, opened in 1887. By 1890, Wichita had become the third-largest city in the state after Kansas City and Topeka with a population of nearly 24,000. After the boom, however, the city entered an economic recession, and many of the original settlers went bankrupt. In 1914 and 1915, deposits of oil and natural gas were discovered in nearby Butler County. This triggered another economic boom in Wichita as producers established refineries, fueling stations, and headquarters in the city. By 1917, there were five operating refineries in Wichita with another seven built in the 1920s. The careers and fortunes of future oil moguls Archibald Derby, who later founded Derby Oil, and Fred C. Koch, who established what would become Koch Industries, both began in Wichita during this period. The money generated by the oil boom enabled local entrepreneurs to invest in the nascent airplane manufacturing industry. In 1917, Clyde Cessna built his Cessna Comet in Wichita, the first aircraft built in the city. In 1920, two local oilmen invited Chicago aircraft builder Emil "Matty" Laird to manufacture his designs in Wichita, leading to the formation of the Swallow Airplane Company. Two early Swallow employees, Lloyd Stearman and Walter Beech, went on to found two prominent Wichita-based companies, Stearman Aircraft in 1926 and Beechcraft in 1932, respectively. Cessna, meanwhile, started his own company in Wichita in 1927. The city became such a center of the industry that the Aeronautical Chamber of Commerce dubbed it the "Air Capital of the World" in 1929. 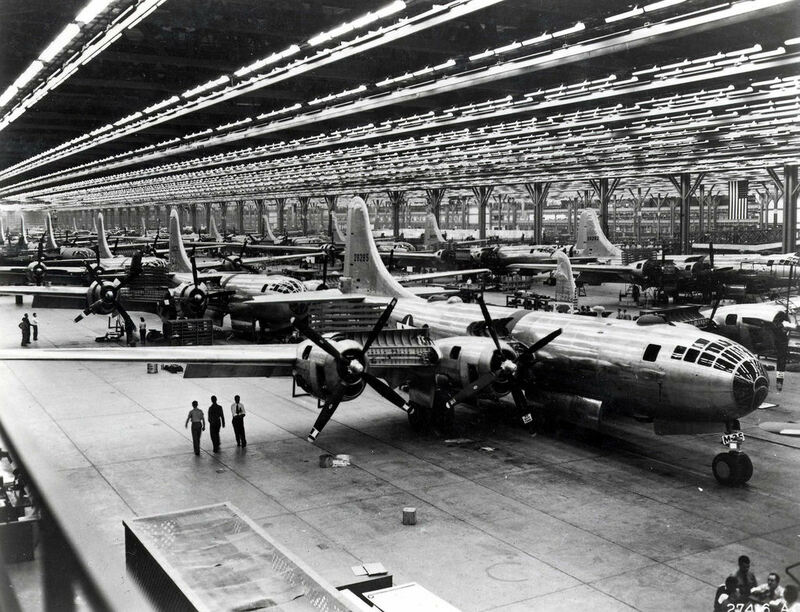 Boeing B-29 assembly line (1944) Over the following decades, aviation and aircraft manufacturing continued to drive expansion of the city. In 1934, Stearman's Wichita facilities became part of Boeing which would become the city's largest employer. Initial construction of Wichita Municipal Airport finished southeast of the city in 1935. During World War II, the site hosted Wichita Army Airfield and Boeing Airplane Company Plant No. 1. The city experienced a population explosion during the war when it became a major manufacturing center for the Boeing B-29 bomber. In 1951, the U.S. Air Force announced plans to assume control of the airport to establish McConnell Air Force Base. By 1954, all non-military air traffic had shifted to the new Wichita Mid-Continent Airport west of the city. In 1962, Lear Jet Corporation opened with its plant adjacent to the new airport. Throughout the late 19th and 20th centuries, several other prominent businesses and brands had their origins in Wichita. A. A. Hyde founded health care products maker Mentholatum in Wichita in 1889. Sporting goods and camping gear retailer Coleman started in the city in the early 1900s. 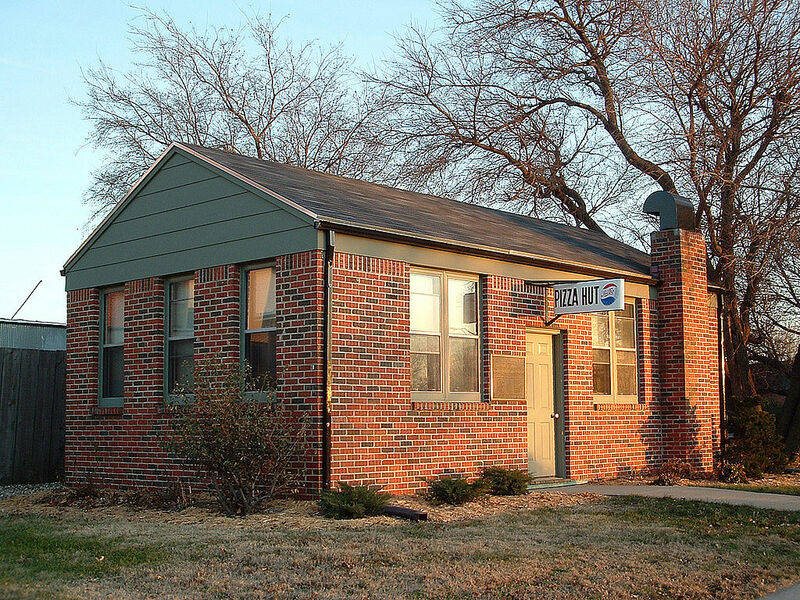 A number of fast food franchises started in Wichita in the 1950s and 1960s including Pizza Hut in 1958. In the 1970s and 1980s, the city became a regional center of health care and medical research. Wichita has been a focal point of national political controversy multiple times in its history. In 1900, famous temperance extremist Carrie Nation struck in Wichita upon learning the city was not enforcing Kansas's prohibition ordinance. The Dockum Drug Store sit-in took place in the city in 1958 with protesters pushing for desegregation. In 1991, thousands of anti-abortion protesters blockaded and held sit-ins at Wichita abortion clinics, particularly the clinic of George Tiller. Tiller was later killed in Wichita by an extremist in 2009. Except for a slow period in the 1970s, Wichita has continued to grow steadily into the 21st century. In the late 1990s and 2000s, the city government and local organizations began collaborating to re-develop downtown Wichita and older neighborhoods in the city. Intrust Bank Arena opened downtown in 2010. Boeing ended its operations in Wichita in 2014. However, the city remains a national center of aircraft manufacturing with other companies including Spirit AeroSystems and Airbus maintaining facilities in Wichita. Wichita Mid-Continent Airport was officially renamed Wichita Dwight D. Eisenhower National Airport after the Kansas native and U.S. President in 2015. Downtown Wichita is located at 37°41'20"N 97°20'10"W (37.688888, -97.336111) at an elevation of 1,299 feet (396 m). Wichita is located in south-central Kansas at the junction of Interstate 35 and U.S. Route 54. Located in the Midwestern United States, it is 157 mi (253 km) north of Oklahoma City, 181 mi (291 km) southwest of Kansas City, and 439 mi (707 km) east-southeast of Denver. The city lies on the Arkansas River near the western edge of the Flint Hills in the Wellington-McPherson Lowlands region of the Great Plains. The topography of the area is characterized by the broad alluvial plain of the Arkansas River valley and the moderately rolling slopes which rise to the higher lands on either side. The Arkansas follows a winding course, south-southeast through Wichita, roughly bisecting the city. It is joined along its course by several tributaries all of which flow generally south. The largest is the Little Arkansas River, which enters the city from the north and joins the Arkansas immediately west of downtown. Further east lies Chisholm Creek which joins the Arkansas in the far southern part of the city. The Chisholm's own tributaries drain much of the city's eastern half; these include the creek's West, Middle, and East Forks as well as, further south, Gypsum Creek. The Gypsum is fed by its own tributary, Dry Creek. Two more of the Arkansas' tributaries lie west of its course; from east to west, these are Big Slough Creek and Cowskin Creek. Both streams run south through the western part of the city. Fourmile Creek, a tributary of the Walnut River, flows south through the far eastern part of the city. According to the United States Census Bureau, the city has a total area of 163.59 sq mi (423.70 km2), of which 159.29 sq mi (412.56 km2) is land and 4.30 sq mi (11.14 km2) is water. As the core of the Wichita metropolitan area, the city is surrounded by suburbs. Bordering Wichita on the north are, from west to east, Valley Center, Park City, Kechi, and Bel Aire. Enclosed within east-central Wichita is Eastborough. Adjacent to the city's east side is Andover. McConnell Air Force Base is in the extreme southeast corner of the city. To the south, from east to west, are Derby and Haysville. Goddard and Maize border Wichita to the west and northwest, respectively. Wichita lies in the northern limits of North America's humid subtropical climate zone (Köppen Cfa), typically experiencing hot, humid summers and cold, dry winters. Located on the Great Plains, far from any large moderating influences such as mountains or large bodies of water, Wichita often experiences severe weather with thunderstorms occurring frequently during the spring and summer months. These occasionally bring large hail as well as frequent lightning, and tornadoes sometimes occur. Particularly destructive tornadoes have struck the Wichita area several times in the course of its history: in September 1965; during the Andover, Kansas Tornado Outbreak of April 1991; and during the Oklahoma tornado outbreak of May 1999. Winters are cold and dry; since Wichita is located roughly midway between Canada and the Gulf of Mexico, cold spells and warm spells are equally frequent. Warm air masses from the Gulf of Mexico can raise mid-winter temperatures into the 50s and even 60s while cold air masses from the Arctic can occasionally plunge the temperature below 0 °F. Wind speed in the city averages 13 mph (21 km/h). On average, January is the coldest month, July is the hottest month, and June is the wettest month. The average temperature in the city is 56.9 °F (13.8 °C). Over the course of a year, the monthly daily average temperature ranges from 32.2 °F (0.1 °C) in January to 81.1 °F (27.3 °C) in July. The high temperature reaches or exceeds 90 °F (32 °C) an average of 62 days a year and 100 °F (38 °C) an average of 12 days a year. The minimum temperature falls to or below 10 °F (-12 °C) on an average 8.5 days a year. The hottest temperature recorded in Wichita was 114 °F (46 °C) in 1936; the coldest temperature recorded was ?22 °F (-30 °C) on February 12, 1899. Readings as low as -17 °F (-27 °C) and as high as 111 °F (44 °C) occurred as recently as February 10, 2011 and July 29–30, 2012, respectively. During an average year, Wichita receives 32.69 inches (830 mm) of precipitation, most of which falls in the warmer months, and experiences 88 days of measurable precipitation. The average relative humidity is 80% in the morning and 49% in the evening. Annual snowfall averages 15.6 inches (40 cm). Measurable snowfall occurs an average of ten days per year with at least an inch of snow being received on five of those days. Snow depth of at least an inch occurs an average of 15 days a year. The average window for freezing temperatures is October 26 through April 11. Wichita has several recognized areas and neighborhoods. The downtown area is generally considered to be east of the Arkansas River, west of Washington Street, north of Kellogg and south of 13th Street. The downtown area contains landmarks such as Century II, the Garvey Center, and the Epic Center. Old Town is also part of downtown; this 50 acre area is home to a cluster of night clubs, bars, restaurants, a movie theater, shops, and apartments and condominiums, many of which make use of historical warehouse-type spaces. The two most notable residential areas of Wichita are Riverside and College Hill. Riverside is northwest of the downtown area, across the Arkansas River, and surrounds the 120-acre (0.49 km2) Riverside Park. College Hill is east of the downtown area, south of Wichita State University. College Hill is one of the more historic neighborhoods, along with Delano on the west side and Midtown in the north-central city. Wichita's principal industrial sector is manufacturing, which accounted for 21.6 percent of area employment in 2003. Aircraft manufacturing has long dominated the local economy, and plays such an important role that it has the ability to influence the economic health of the entire region; the state offers tax breaks and other incentives to aircraft manufacturers. Healthcare is Wichita's second-largest industry, employing approximately 28,000 people in the local area. Since healthcare needs remain fairly consistent regardless of the economy, this field was not subject to the same pressures that affected other industries in the early 2000s. The Kansas Spine Hospital opened in 2004, as did a critical care tower at Wesley Medical Center. In July 2010, Via Christi Health, which is the largest provider of healthcare services in Kansas, opened a hospital that will serve the northwest area of Wichita. Via Christi Hospital on St. Teresa is the system's fifth hospital to serve the Wichita community. Thanks to the early 20th-Century oil boom in neighboring Butler County, Kansas, Wichita became a major oil town, with dozens of oil exploration companies and support enterprises. Most famous of these was Koch Industries, today a global natural-resources conglomerate. The city was also at one time the headquarters of the former Derby Oil Company, which was purchased by Coastal Corporation in 1988. Koch Industries and Cargill, the two largest privately held companies in the United States, both operate headquarters facilities in Wichita. Koch Industries' primary global corporate headquarters is located in a large office-tower complex in northeast Wichita. Cargill Meat Solutions Div., at one time the nation's 3rd-largest beef producer, is headquartered downtown. Other firms with headquarters in Wichita include roller-coaster manufacturer Chance Morgan, gourmet food retailer Dean & Deluca, renewable energy company Alternative Energy Solutions, and Coleman Company, a manufacturer of camping and outdoor recreation supplies. Air Midwest, the nation's first officially certificated "commuter" airline, was founded and headquartered in Wichita and evolved into the nation's 8th largest regional airline prior to its dissolution in 2008. As of 2013, 68.2% of the population over the age of 16 was in the labor force. 0.6% was in the armed forces, and 67.6% was in the civilian labor force with 61.2% employed and 6.4% unemployed. The occupational composition of the employed civilian labor force was: 33.3% in management, business, science, and arts; 25.1% in sales and office occupations; 17.2% in service occupations; 14.0% in production, transportation, and material moving; 10.4% in natural resources, construction, and maintenance. The three industries employing the largest percentages of the working civilian labor force were: educational services, health care, and social assistance (22.3%); manufacturing (19.2%); and retail trade (11.0%). The cost of living in Wichita is below average; compared to a U.S. average of 100, the cost of living index for the city is 84.0. As of 2013, the median home value in the city was $117,500, the median selected monthly owner cost was $1,194 for housing units with a mortgage and $419 for those without, and the median gross rent was $690. From the early to late 20th century, aircraft pioneers such as Clyde Cessna, "Matty" Laird, Lloyd Stearman, Walter Beech, Al Mooney and Bill Lear began aircraft-manufacturing enterprises that would lead to Wichita becoming the nation's leading city in numbers of aircraft produced. The aircraft corporations E. M. Laird Aviation Company (the nation's first successful commercial airplane manufacturer), Travel Air (started by Beech, Stearman and Cessna), Stearman, Cessna, Beechcraft and Mooney were all founded in Wichita between 1920 and early 1932. By 1931, Boeing (of Seattle, Washington) had absorbed Stearman, creating "Boeing-Wichita", which would eventually grow to become Kansas' largest employer. operate in the Wichita MSA, as well dozens of suppliers and subcontractors to the local aircraft manufacturers. In total, Wichita and its companies have manufactured an estimated 250,000 aircraft since Clyde Cessna's first Wichita-built aircraft in 1916. In the early 2000s, a national and international recession combined with the after effects of the November 9, 2001 terrorist attacks to depress the aviation sub-sector in and around Wichita. Orders for new aircraft plummeted, prompting Wichita's five largest aircraft manufacturers, Boeing Co., Cessna Aircraft Co., Bombardier Learjet Inc., Hawker Beechcraft and Raytheon Aircraft Co.—to slash a combined 15,000 jobs between 2001 and 2004. In response, these companies began developing small- and mid-sized airplanes to appeal to business and corporate users. In 2007, Wichita built 977 aircraft, ranging from single-engine light aircraft to the world's fastest civilian jet; one-fifth of the civilian aircraft produced in United States that year, plus numerous small military aircraft. In early 2012, Boeing announced it would be closing its Wichita plant by the end of 2013, which paved the road for Spirit Aerosystems to open its plant. Wichita is a cultural center for Kansas, home to several art museums and performing arts groups. The Wichita Art Museum is the largest art museum in the state of Kansas and contains 7,000 works in permanent collections. The Ulrich Museum of Art at Wichita State University is a modern and contemporary art museum with over 6,300 works in its permanent collection. Small art galleries are scattered around the city with some clustered in the districts of Old Town, Delano and south Commerce street. These galleries started the Final Friday Gallery crawl event, where visitors tour attractions free in the evening on the last Friday of each month. Larger museums began participating and staying open late on Final Fridays shortly after its beginning. Wichita is the music hub of central Kansas, and draws major acts from around the world, performing at various concert halls, arenas and stadiums around the area. Most major rock'n'roll and pop-music stars, and virtually all country music stars, perform there during their career. Music Theatre Wichita, Wichita Grand Opera (both nationally renowned), and the Wichita Symphony Orchestra perform regularly at the Century II Convention Hall downtown. Concerts are also regularly performed by the nationally noted schools of music at Wichita's two largest universities. The Orpheum Theatre, built in 1922, serves as a downtown venue for smaller shows. Wichita is alleged to be the birthplace of the electric guitar, the fuzz box, and other key innovations in rock'n'roll music. The Wichita River Festival has been held in the Downtown and Old Town areas of the city since 1972. It has featured events, musical entertainment, sporting events, traveling exhibits, cultural and historical activities, plays, interactive children's events, a flea market, river events, a parade, block parties, a food court, fireworks, and souvenirs for the roughly 370,000+ patrons who attend each year. In 2011, the festival was moved from May to June because of rain during previous festivals. The annual Wichita Black Arts Festival, held in the spring, celebrates the arts, crafts and creativity of Wichita's large African-American community. It usually takes place in Central-Northeast Wichita. A Juneteenth event and parade also are common annual events. The International Student Association at Wichita State University presents an annual international cultural exhibition and food festival, on the campus at WSU, providing an inexpensive sampling of global culture and cuisine to the general public. One or more large Renaissance fairs occur annually, including the "RenFair" in conjunction with the "Kingdom of Calontir" of the SCA (Society for Creative Anachronism). The fairs vary in length from one day to a week, typically at Sedgwick County Park or Newman University. The Wichita Public Library's Academy Awards Shorts program is reportedly the oldest annual, complete, free public screening outside of Hollywood of the full array of short films nominated for an Academy Award ("Oscar"). In late winter, shortly before the Academy Awards ceremonies, the films—including all nominated documentary, live action, and animated shorts—are presented, free, at the Library and in local theaters and other venues around Wichita. Wichita's former Congressman, Motion Picture Association President Dan Glickman, has served as Honorary Chair of the event, and some of the filmmakers have attended and visited with the audiences. The Tallgrass Film Festival has been held in downtown Wichita since 2003. It draws over 100 independent feature and short films from all over the world for three days each October. Notable people from the entertainment industry have attended in the past. 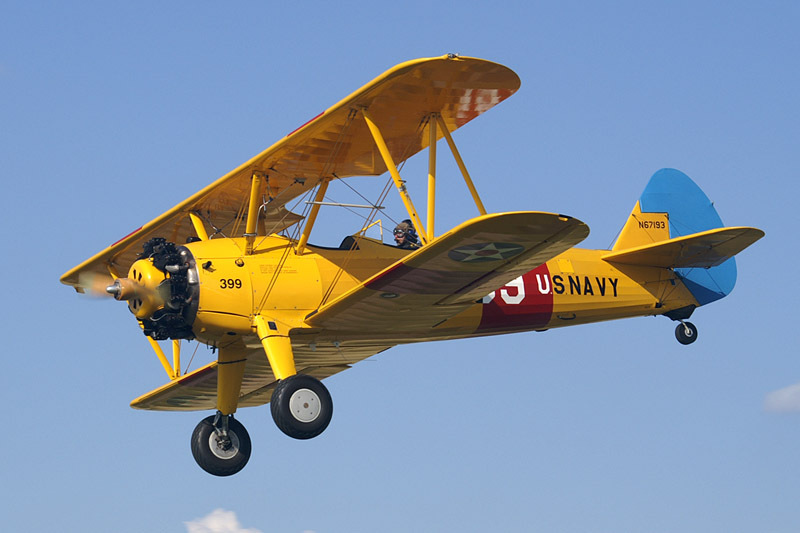 Aviation-related events are common in the Wichita area, including air shows, fly-ins, air races, aviation conferences, exhibitions, and trade shows. The city's two main air shows, which are generally held in alternating years, are the city-sponsored civilian Wichita Flight Festival (originally the "Kansas Flight Festival") and the military-sponsored McConnell Air Force Base Open House and Airshow. [ Both are large regional air shows with famous acts and multimillion-dollar aircraft displays (including many Wichita-built aircraft). In addition, numerous local, regional, and national aviation organizations host fly-ins, conferences, exhibitions and trade shows in the Wichita area on irregular schedules. Museums and landmarks devoted to science, culture, and area history are located throughout the city. Several lie along the Arkansas River west of downtown, including the Exploration Place science and discovery center, the Mid-America All-Indian Center, the Old Cowtown living history museum, and The Keeper of the Plains statue and its associated display highlighting the daily lives of Plains Indians. The Wichita-Sedgwick County Historical Museum in downtown Wichita occupies the original Wichita city hall, built in 1892. The museum contains artifacts that tell the story of Wichita and Sedgwick County starting from 1865 and continuing to the present day.] Nearby is the 1913 Sedgwick County Memorial Hall and Soldiers and Sailors Monument. East of downtown are the Museum of World Treasures and railroad-oriented Great Plains Transportation Museum. The Coleman Factory Outlet and Museum on 235 N St. Francis street is the home of the Coleman Lantern and offers free admission. Wichita State University hosts the Lowell D. Holmes Museum of Anthropology. The Kansas Aviation Museum, housed in the Terminal and Administration building of the former Municipal Airport, is located in southeast Wichita adjacent to McConnell Air Force Base. Botanica, The Wichita Gardens, also located along the Arkansas River, boasts 24 themed gardens including the popular Butterfly Garden and the award-winning Sally Stone Sensory Garden. The Sedgwick County Zoo in the northwest part of Wichita is the most popular outdoor tourist attraction in the state of Kansas, and is home to more than 2,500 animals representing 500 different species. The zoo is next to Sedgwick county park and Sedgwick County Extension Arboretum. Intrust Bank Arena is the city's primary event venue, featuring 22 suites, 2 party suites, 40 loge boxes and over 300 premium seats with a total potential capacity of over 15,000. This arena in the middle of Wichita opened in January 2010. Located immediately east of downtown is Old Town, the city's entertainment district. In the early 1990s, developers transformed it from an old warehouse district into a mixed-zone neighborhood with residential space, nightclubs, restaurants, hotels, and museums. Moody's Skidrow Beanery, at 625 E. Douglas in what was to become Old Town, was one of the more famous places in Wichita in the 1960s. It was the scene of a nationally followed First Amendment struggle and was visited by Allen Ginsberg in 1966 (the name had been changed to the Magic Theatre Vortex Art Gallery) where he first read his long poem "Wichita Vortex Sutra." Wichita is also home to two major shopping malls: Towne East Square and Towne West Square, on opposite ends of town, and each managed by Simon Property Group. Each mall is home to four anchor stores, and has more than 100 tenants apiece. The oldest mall, Wichita Mall, was for many years largely a dead mall, but has since been converted into office space. There are also two large outdoor shopping centers, Bradley Fair on the city's north-east side and NewMarket Square on the city's north-west side, each with over 50 stores spread out on several acres. In 1936, the Wichita post office contained two oil-on-canvas murals, Kansas Farming, painted by Richard Haines and Pioneer in Kansas by Ward Lockwood. Murals were produced from 1934 to 1943 in the United States through the Section of Painting and Sculpture, later called the Section of Fine Arts, of the Treasury Department. The post office building became the Federal Courthouse at 401 N. Market Street and the murals are on display in the lobby. Wichita has a number of beautiful parks and recreational areas such as Riverside park, College Hill park, and McAdams park. Wichita has developed a positive reputation in U.S. media as an affordable and pleasant place to live. In July 2006, CNN/Money and Money ranked Wichita ninth on their list of the 10 best U.S. big cities in which to live. In 2008, MSN Real Estate ranked Wichita 1st on its list of most affordable cities. Wichita was also named the most "Uniquely American" city by Newsmax magazine in a May 2009 piece written by Peter Greenberg. Wichita is mentioned in the songs "Wichita Skyline" by Shawn Colvin, "Seven Nation Army" by The White Stripes, and "Captain Bobby Stout" by local musician Jerry Hahn. Allen Ginsberg wrote about a visit to Wichita in his poem Wichita Vortex Sutra, for which Philip Glass subsequently wrote a solo piano piece. Glen Campbell's "Wichita Lineman", written by Jimmy Webb, peaked at number 1 on Billboard's country singles chart and at number 3 on the pop chart in 1968. Ruby Vroom, released by the band Soul Coughing in 1994, contains a song called "True Dreams of Wichita". Also, country trio Lady Antebellum recorded the song "Golden" for their fifth studio album of the same name. The opening line of that song is "Sunset falls on Wichita". The city has been a setting of various works of fiction. The award-winning stage play Hospitality Suite written by Roger Rueff takes place in Wichita as does its 1999 film adaptation, The Big Kahuna. Wichita (1955) and portions of Wyatt Earp (1994), both of which dramatize the life and career of Wyatt Earp, are set in Wichita. The short-lived 1959–1960 television western Wichita Town was set during the city's early years. Other films wholly or partially set in the city include Good Luck, Miss Wyckoff (1979), Planes, Trains and Automobiles (1987), The Ice Harvest (2005), and Knight and Day (2010). The city is also the setting of the long-running comic strip Dennis the Menace. AMD planned to release a new processor, code named Wichita, in 2012, but the project was cancelled in favor of a newer design. Wichita is home to several professional, semi-professional, non-professional, and collegiate sports teams. Professional teams include the Wichita Thunder ice hockey team, Wichita Force indoor football team, and Wichita Wingnuts baseball team. Defunct professionals teams which used to play in Wichita include the Wichita Aeros and Wichita Wranglers baseball teams, the Wichita Wings indoor soccer team, the Wichita Wind (farm team to the Edmonton Oilers in the early 1980s) and the Wichita Wild indoor football team. Semi-pro teams include Kansas Cougars and Kansas Diamondbacks football teams. Non-professional teams include the Wichita Barbarians rugby union team and the Wichita World 11 cricket team. The city hosts the Air Capital Classic, a professional golf tournament of the Web.com Tour first played in 1990. Collegiate teams based in the city include the Wichita State University Shockers, Newman University Jets, and the Friends University Falcons. The WSU Shockers are NCAA Division I teams which compete in men's and women's basketball, baseball, volleyball, track and field, tennis, and bowling. The Newman Jets are NCAA Division II teams which compete in baseball, basketball, bowling, cross country, golf, soccer, tennis, wrestling, volleyball, and cheer/dance. The Friends Falcons compete in Region IV of the NAIA in football, volleyball, soccer, cross country, basketball, tennis, track and field, and golf. Several sports venues are located in and around the city. Intrust Bank Arena, located downtown, is a 15,000-seat multi-purpose arena that is home to the Wichita Thunder and Wichita Force. Lawrence–Dumont Stadium, located just west of downtown, is a medium-sized baseball stadium that has been home to Wichita's various minor-league baseball teams over the years. It is also home of the minor-league National Baseball Congress and the site of the Congress's annual National Tournament. Wichita Ice Arena, also just west of downtown, is a public ice-skating rink used for ice-skating competitions. In addition, Century II has been used for professional wrestling tournaments, sporting-goods exhibitions, and other recreational activity. The WSU campus includes two major venues: Eck Stadium, a medium-sized stadium with a full-sized baseball field that is home to the WSU Shocker baseball team, and Charles Koch Arena, a medium-sized, dome-roofed circular arena with a collegiate basketball court that hosts the WSU Shocker basketball team. Koch Arena is also used extensively for citywide and regional high school athletic events, concerts and other entertainments. Located just north of the city is 81 Motor Speedway, an oval motor-vehicle racetrack used extensively for a wide range of car, truck and motorcycle races, and other motor sports events. Neighboring Park City is home to Hartman Arena and the Sam Fulco Pavilions, a moderate-capacity low-roofed arena developed for small rodeos, horse shows, livestock competitions, and exhibitions. In December 2017, Wichita's mayor announced plans to bring a Minor League Baseball to the city. The Major League Baseball-affiliated team would play in a planned new ball park. Wichita is also home to two sports museums, the Kansas Sports Hall of Fame and the Wichita Sports Hall of Fame and Museum. Under state statute, Wichita is a city of the first class. Since 1917, it has had a council-manager form of government. The city council consists of seven members popularly elected every four years with staggered terms in office. For representative purposes, the city is divided into six districts with one council member elected from each district. The mayor is the seventh council member, elected at large. The council sets policy for the city, enacts laws and ordinances, levies taxes, approves the city budget, and appoints members to citizen commission and advisory boards. The council meets each Tuesday. The city manager is the city's chief executive, responsible for administering city operations and personnel, submitting the annual city budget, advising the city council, preparing the council's agenda, and oversight of non-departmental activities. The Wichita Police Department, established in 1871, is the city's law enforcement agency. With over 800 employees, including more than 600 commissioned officers, it is the largest law enforcement agency in Kansas. The Wichita Fire Department, organized in 1886, operates 22 stations throughout the city. Organized into four battalions, it employs over 400 full-time firefighters. As the county seat, Wichita is the administrative center of Sedgwick County. The county courthouse is located downtown, and most departments of the county government base their operations in the city. Many departments and agencies of the U.S. Government have facilities in Wichita. The Wichita U.S. Courthouse, located downtown, is one of the three courthouses of the U.S. District Court for the District of Kansas. The U.S. Air Force operates McConnell Air Force Base immediately southeast of the city. The campus of the Robert J. Dole Department of Veterans Affairs Medical and Regional Office Center is located on U.S. 54 in east Wichita. Other agencies, including the Federal Bureau of Investigation, Food and Drug Administration, and Internal Revenue Service among others, have offices in locations around the city. Wichita lies within Kansas's 4th U.S. Congressional District. For the purposes of representation in the Kansas Legislature, the city is located in the 16th and 25th through 32nd districts of the Kansas Senate and the 81st, 83rd through 101st, 103rd, and 105th districts of the Kansas House of Representatives. With over 50,000 students, Wichita Public Schools (USD 259) is the largest school district in Kansas. It operates more than 90 schools in the city including 10 high schools, 16 middle schools, 61 elementary schools, and more than a dozen special schools and programs. Outlying portions of Wichita lie within suburban public school districts including Andover (USD 385), Circle (USD 375), Derby (USD 260), Goddard (USD 265), Haysville (USD 261), Maize (USD 266), and Valley Center (USD 262). There are more than 35 private and parochial schools in Wichita. The Roman Catholic Diocese of Wichita oversees 16 Catholic schools in the city including 14 elementary schools and two high schools, Bishop Carroll Catholic High School and Kapaun Mt. Carmel High School. The Lutheran Church–Missouri Synod operates two Lutheran schools in the city, Bethany Lutheran School (Grades PK-5) and Holy Cross Lutheran School (PK-8). There are also two Seventh-day Adventist schools in Wichita, Three Angels School (K-8) and Wichita Adventist Christian Academy (K-10). Other Christian schools in the city are Calvary Christian School (PK-12), Central Christian Academy (K-8), Sunrise Christian Academy (PK-12), Trinity Academy (9-12), Wichita Friends School (PK-6), and Word of Life Traditional School (K-12). In addition, there is an Islamic school, Anoor School (PK-8), operated by the Islamic Society of Wichita. Non-religious private schools in the city include Wichita Collegiate School and The Independent School as well as three Montessori schools. Three universities have their main campuses in Wichita. The largest is Wichita State University (WSU), a public research university classified by Carnegie as "R2: Doctoral Universities – Higher Research Activity." WSU has more than 14,000 students and is the third-largest university in Kansas. WSU's main campus is in northeast Wichita with four satellite campuses located around the metro area. Friends University, a private, non-denominational Christian university, has its main campus in west Wichita as does Newman University, a private Catholic university. In addition, Wichita Area Technical College, a two-year public college, has its main campus and two satellite locations in the city. Several colleges and universities based outside Wichita operate satellite locations in and around the city. The University of Kansas School of Medicine has one of its three campuses in Wichita. Baker University, Butler Community College, Embry-Riddle Aeronautical University, Southwestern College, Tabor College, Vatterott College, and Webster University have Wichita facilities as do for-profit institutions including Heritage College and University of Phoenix. The Wichita Public Library is the city's library system, presently consisting of a Central Library downtown and nine branch locations in neighborhoods around the city. The library operates several free programs for the public, including special events, technology training classes, and programs specifically for adults, children, and families. As of 2009, its holdings included more than 1.3 million books and 2.2 million items total. The Wichita Eagle, which began publication in 1872, is the city's major daily newspaper. With a daily circulation of over 67,000 copies, it has the highest circulation of any newspaper published in Kansas. The Wichita Business Journal is a weekly newspaper that covers local business events and developments. Several other newspapers and magazines, including local lifestyle, neighborhood, and demographically-focused publications are also published in the city. These include, among others: The Community Voice, aimed at the city's African American community; the monthly East Wichita News; F5, a weekly alternative newspaper; the Liberty Press, LGBT news; Splurge!, a local fashion and lifestyle magazine; the Sunflower, the WSU student newspaper. The Wichita media market also includes local newspapers in several surrounding suburban communities. The Wichita radio market includes Sedgwick County and neighboring Butler and Harvey counties. Six AM and 18 FM radio stations are licensed to and/or broadcast from the city. Wichita is the principal city of the Wichita-Hutchinson, Kansas television market which consists of the western two-thirds of the state. All of the market's network affiliates broadcast from Wichita with the ABC, CBS, CW, FOX and NBC affiliates serving the wider market through state networks of satellite and translator stations. The city also hosts a PBS member station, a Univision affiliate, and several low-power stations. Cable television service for Wichita and the surrounding area is provided by AT&T U-Verse and Cox Communications. Wichita suffered severe floods of the Arkansas river in 1877, 1904, 1916, 1923, 1944, 1951 and 1955. In 1944 the city flooded 3 times in 11 days. As a result of the 1944 flood, the idea for the Wichita-Valley Center Floodway (locally known as the "Big Ditch") was conceived. The project was completed in 1958. The Big Ditch diverts part of the Arkansas River's flow around west-central Wichita, running roughly parallel to the Interstate 235 bypass. A second flood control canal lies between the lanes of Interstate 135, running south through the central part of the city. Chisholm Creek is diverted into this canal for most of its length. The city's flood defenses were tested in the Great Flood of 1993. Flooding that year kept the Big Ditch full for more than a month and caused $6 million of damage to the flood control infrastructure. The damage was not fully repaired until 2007. Several federal and state highways pass through Wichita. Interstate 35, as the Kansas Turnpike, enters the city from the south and turns northeast, running along the city's southeastern edge and exiting through the eastern part of the city. Interstate 135 runs generally north-south through the city, its southern terminus lying at its interchange with I-35 in south-central Wichita. Interstate 235, a bypass route, passes through north-central, west, and south-central Wichita, traveling around the central parts of the city. Both its northern and southern termini are interchanges with I-135. U.S. Route 54 and U.S. Route 400 run concurrently through Wichita as Kellogg Avenue, the city's primary east-west artery, with interchanges, from west to east, with I-235, I-135, and I-35. U.S. Route 81, a north-south route, enters Wichita from the south as Broadway, turns east as 47th Street South for approximately half a mile, and then runs concurrently north with I-135 through the rest of the city. K-96, an east-west route, enters the city from the northwest, runs concurrently with I-235 through north-central Wichita, turns south for approximately a mile, running concurrently with I-135 before splitting off to the east and traveling around northeast Wichita, ultimately terminating at an interchange with U.S. 54/U.S. 400 in the eastern part of the city. K-254 begins at I-235's interchange with I-135 in north-central Wichita and exits the city to the northeast. K-15, a north-south route, enters the city from the south and joins I-135 and U.S. 81 in south-central Wichita, running concurrently with them through the rest of the city. K-42 enters the city from the southwest and terminates at its interchange with U.S. 54/U.S. 400 in west-central Wichita. Wichita Transit operates 53 buses on 18 fixed bus routes within the city. The organization reports over 2 million trips per year (5,400 trips per day) on its fixed routes. Wichita Transit also operates a demand response paratransit service with 320,800 passenger trips annually. A 2005 study ranked Wichita near the bottom of the fifty largest American cities in terms of percentage of commuters using public transit. Only 0.5% used it to get to or from work. Greyhound Lines provides intercity bus service northeast to Topeka and south to Oklahoma City, Oklahoma. Bus service is provided daily north towards Salina and west towards Pueblo, Colorado by BeeLine Express (subcontractor of Greyhound Lines). The Greyhound bus station that was built in 1961 at 312 S Broadway is closing in 2016, and services will be relocated 1 block northeast to the Wichita Transit station at 777 E Waterman. The Wichita Airport Authority manages the city's two main public airports, Wichita Dwight D. Eisenhower National Airport and Colonel James Jabara Airport. Located in the western part of the city, Wichita Dwight D. Eisenhower National Airport is the city's primary airport as well as the largest airport in the state of Kansas. Five commercial airlines (Allegiant, American, Delta, Southwest & United) serve Wichita Dwight D. Eisenhower National Airport with non-stop flights to several U.S. airline hubs. Jabara Airport is a general aviation facility located on the city's northeast side. In addition, there are several privately owned airports located throughout the city. Cessna Aircraft Field and Beech Factory Airport, operated by manufacturers Cessna and Beechcraft, respectively, lie in east Wichita. Two smaller airports, Riverside Airport and Westport Airport, are located in west Wichita. Two Class I railroads, BNSF Railway and Union Pacific Railroad (UP), operate freight rail lines through Wichita. UP's OKT Line runs generally north-south through the city; north of downtown, the line consists of trackage leased to BNSF. An additional UP line enters the city from the northeast and terminates downtown. BNSF's main line through the city enters from the north, passes through downtown, and exits to the southeast, paralleling highway K-15. The Wichita Terminal Association, a joint operation between BNSF and UP, provides switching service on three miles (5 km) of track downtown. In addition, two lines of the Kansas and Oklahoma Railroad enter the city, one from the northwest and the other from the southwest, both terminating at their junction in west-central Wichita. Wichita has not had passenger rail service since 1979. The nearest Amtrak station is in Newton 25 miles (40 km) north, offering service on the Southwest Chief line between Los Angeles and Chicago. Amtrak offers bus service from downtown Wichita to its station in Newton as well as to its station in Oklahoma City, the northern terminus of the Heartland Flyer line. Wyatt Earp served as a lawman in several Western frontier towns, including Wichita. He is best known for his part in the Gunfight at the O.K. Corral and as one of the Old West's "toughest and deadliest gunmen of his day". Mike Pompeo, former Kansas Fourth Congressional District Representative, Director of U.S. Central Intelligence Agency, from the Wichita area. Robert Gates, former Director of U.S. Central Intelligence Agency, and Secretary of Defense, is a Wichita native, and graduate of Wichita schools. Dan Glickman, former Secretary of Agriculture, and former head of the Motion Picture Association, began his political career in Wichita, first on the school board, then as 4th District Congressman. Koch family (particularly Charles and David Koch), prominent American billionaires, libertarian and conservative political activists, organizers and major donors, co-founders of the American Enterprise Institute, the Cato Institute, and Americans for Prosperity, leading financiers of 21st Century conservative and libertarian political candidates in the United States. David was the Libertarian Party's vice-presidential nominee in the 1980 presidential election. Donald Hollowell, prominent attorney in the Civil Rights Movement, particularly in Atlanta, Georgia, who successfully sued to integrate Atlanta's public schools and buses, and Georgia colleges and universities; freed Martin Luther King, Jr. from prison; and mentored civil rights attorneys (including Vernon Jordan and Horace Ward). Businessmen Charles and David Koch (Koch Industries), Dan and Frank Carney (Pizza Hut), Clyde Cessna (Cessna Aircraft), Walter Herschel Beech (Beech Aircraft Company), Bill Lear (Lear Jet), and businesswoman Olive Ann Beech (Beech Aircraft Company) all lived in Wichita. Athletes including Pro Football Hall of Fame running backs Gale Sayers and Barry Sanders, Basketball Hall of Famer Lynette Woodard, and current UFC flyweight fighter Tim Elliott were all born and/or raised in Wichita. Olympic medal-winning athletes Jim Ryun, (silver medal, 1500 meters, 1968 Summer Olympics) and Nico Hernandez, (bronze medal, boxing, 2016 Summer Olympics) are from Wichita. Musician Joe Walsh, founding member of the band James Gang and later member of The Eagles, is from Wichita. American Idol Season 6 finalist Phil Stacey attended high school in Wichita. Early network television news commentator, spokesperson and game show panelist John Cameron Swayze, and Jim Lehrer PBS News Hour anchor-editor were both Wichita natives. Melissa McDermott was an anchor at Wichita's KSNW before her job at CBS's Up to the Minute in the 1980s and 1990s. Network sportscaster Andrea Joyce (NBC, CBS, ESPN) was first a news anchor for Wichita's KWCH/KTVH-TV in the 1980s. Musician Jay Bentley (born June 6, 1964, Wichita, Kansas) is the bassist and co-founding member of the punk rock group Bad Religion. On occasions he will also play bass for Me First and the Gimme Gimmes. Heavy Metal band Manilla Road are from Wichita. Miles City is a city in and the county seat of Custer County, Montana, United States. The population was 8,410 at the 2010 census. Miles City, 1881 After the Battle of the Little Bighorn in 1876, the U.S. Army created forts in eastern Montana, including one where the north-flowing Tongue River flowed into the east-flowing Yellowstone River. The first fort was known as the Tongue River Cantonment or the Tongue River Barracks and was founded on August 27, 1876. A second, permanent fort was constructed on higher ground two miles to the west of the mouth of the Tongue and this became Fort Keogh. Fort Keogh (named after Captain Myles Keogh, one of the battle dead, whose horse, Comanche, was the lone survivor of Custer's command) started as a few rough winter cabins, but grew into a moderate sized western fort, from which its commander, General Nelson A. Miles, effectively brought the remaining "uncontrolled" Native Americans into subjugation during the last decade of the 1800s. official plat both called the town "Miles City." When the old cantonment moved two miles west, the town literally picked up and followed, moving to the current site. The last occupants of Old Miles City stayed on until 1900 but the new community was the one that grew. Before the town itself was founded, George Miles, the nephew of General Miles, who had accompanied his uncle on the western expedition and served in the quartermasters office, bought a herd of sheep, the first of many commercial enterprises in his involvement with the core founders of the town. Livestock speculation brought thousands of cattle to the open ranges in the late 1880s, the railroad was extended through the area, and Texas drove numerous cattle to Miles City to fatten them on free grass and move them to where they could be loaded on trains bound for the slaughterhouses in Chicago. Miles City established a municipal electric utility around 1887 and it was a source of civic pride (as any city would have towards its own utilities) until a traveling employee of Minnesota Northern Power (predecessor of MDU Resources Group, Inc.) told the city council "the emperor has no clothes;" i.e., the system was far less efficient and in worse shape than they thought. The city council eventually put the question to the voters who instructed the city to sell the utility. By this time, the people with the Montana Power Company (now NorthWestern Energy's Montana division) became aware of this and were soon locked in an epic battle with Minnesota Northern over the franchise. A franchise election was held to determine who would serve Miles City on June 28, 1927. Minnesota Northern won by a scant 16 votes. Miles City experienced rapid growth until the 1920s and 1930s, but became overshadowed by the upstart upriver town of Billings, which was at the cross roads of transportation routes, and it became a banking center, oil refining center, and medical service center and is now the largest city in the state. The publicly owned Miles City Municipal Airport is located less than two miles (3 km) from town. Notably, it was the site of an early scheduled airline crash, involving Northwest Airlines Flight 1, which caught fire and crashed shortly after takeoff in January, 1939.